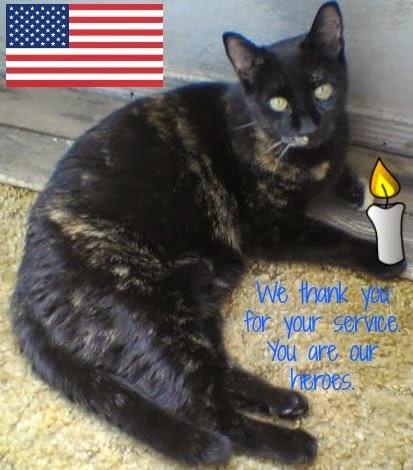 We thank our veterans too. Those that serve/served our country are true heroes. Very nice photo and graphic. I am enjoying seeing everyone Veteran's Day posts, it is nice to see how thankful we all are for the military. That's really sweet, Truffles. We are thankful for our veterans, too! We thank our veterans and wish they weren’t treated like garbage when they came home. This week there’s been stories in the paper about two veteran housing projects that are full of mice, roaches, bedbugs, rats, etc and have many other violations. It’s a shame men and women who fought for us should have to live like this. We couldn't agree more with wishing all of our Veterans a grateful thank you for all they've done to protect us and keep us free and safe. Salute to our veterans, and we thank them for all that they have done for us and our country!